Eternity ring with Round Brilliant Cut diamonds channel set into the 2mm wide band. 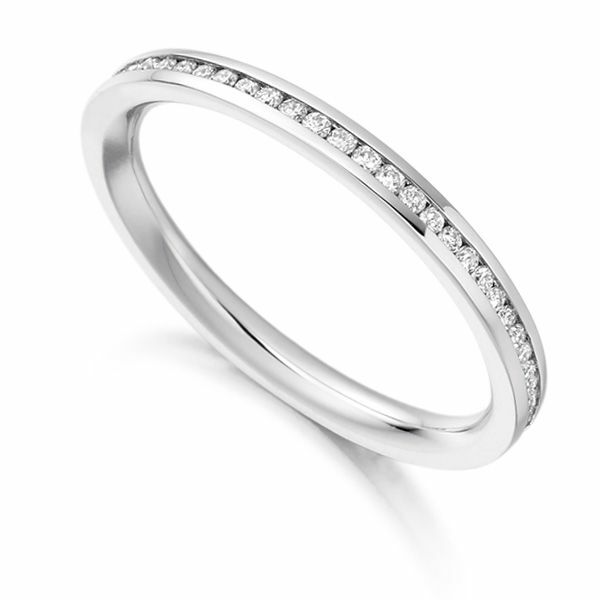 A distinctive fully channel set, Round Brilliant cut Diamond Eternity Ring. This effortlessly graceful ring design is channel set with 0.33 carats of VS1 Clarity Brilliant cut Diamonds which have been graded F in Colour. It measures a slender 2.00mm in width and is a comfortable court profile which would rest gracefully next to your other precious rings. Available in a choice of 18 Carat White, Rose or Yellow Gold and 950 Palladium or 950 Platinum finishes. This exquisite ring will arrive beautifully packaged ready for that special moment. Please allow up to 4 weeks for delivery as this design is crafted to order. Many buyers ask us the difference between diamond eternity rings and diamond wedding rings. Our collection is divided into both categories to make searching easier. Most of our designs are, however, versatile. They can serve the purpose of either a diamond set wedding ring or a diamond eternity ring depending on the occasion. Purchase your diamond wedding ring or eternity ring from Canada and receive your parcel within 1-3 days from when we sent out your ring. All deliveries arrive fully insured by Fedex with all duty and tax considered before purchasing on our website. Most rings take around 4 weeks to create before we ship, beautifully presented in luxury packaging. Contact us with any questions on products and services. We are always on hand to help with friendly expert guidance. Arrange your free UK sizer which will be sent by airmail straight out to Canada in a plain white envelope without any obligation to purchase.